﻿Despite the many and varied uses to which a plastic bag can be put, including of course that for which it is most renowned - cutting off the circulation to a large part of your hand with handles apparently made from razor blades - they are an Ecological Menace. Some recent random browsing on my part turned up a collection of mournful pictures showing various creatures wrapped in their non-biodegradable embrace. Whales, turtles and seabirds, apparently, eat them, mistaking them for jellyfish or other edible morsels. I'm quite sure the advance of the plastic bag affects other wildlife too - what one might do to the average animal digestive tract doesn't really bear thinking about. ﻿﻿﻿﻿﻿It is unfair to place the burden of all this on the shoulders of the average consumer. Like many others, I attempt to be a Responsible Shopper, and have a collection of Bags For Life that would impress even the most ardent eco-warrior. But also like many others, I have a tendency to forget the damn things and end up buying yet another out of pure guilt at the supermarket checkout (which, by the way, I'm sure is a devious plan by BFL makers. Make 'em impossible to carry around in the average handbag by using that stiff and scratchy stuff that simply refuses to fold into a manageable shape.) Last time I cleaned out my hall cupboard, I found a bag of bags, holding nothing but dust bunnies the size of your Auntie and the remnants of one very dead spider. Ridiculous. So. I have a very simple solution. 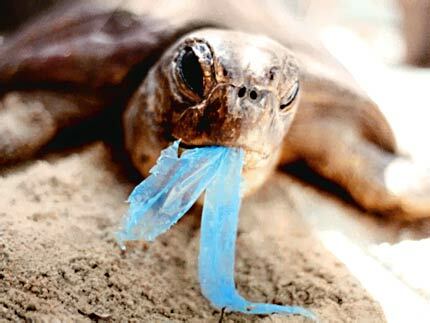 The people who make plastic bags need to start using biodegradable materials. It's entirely do-able. We now have cornstarch bags for home composting use. Why aren't all plastic bags made of the same stuff? OK, it's probably more expensive. So what? Shops are charging us for them anyway, it's surely just a matter of passing the cost along. They might not be that strong, but again so what? How many times has a regular bag given way at the seams just as you were lifting it into the car / getting onto the bus / walking home, leaving a trail of consumer goods in your wake as you stagger along under the weight of your weekly shop, wondering vaguely if this is the time your hands will actually fall off? And how strong does a bag have to be to live forever in the cupboard under the sink once you've emptied it of what remains of your shopping? The only sensible solution to the pestilence of plastic is to stop making the stuff. It shouldn't be up to us to sort this out - well, not entirely, anyway. We can continue amassing vast collections of jute and hessian carriers and forgetting to take them with us every time we go shopping, but it's up to the people who feed this consumer addiction to start stepping up to the plate. Nuff said.